The first waves to hit Hawaii from a tsunami triggered by a massive earthquake off Japan have washed up onshore at Waikiki, with no initial reports of any damage. The Pacific Tsunami Warning Centre reported wave changes at Waianae Harbour around 3.24am on Friday (0024 AEDT Saturday), shortly before the relatively small waves were seen at Waikiki. 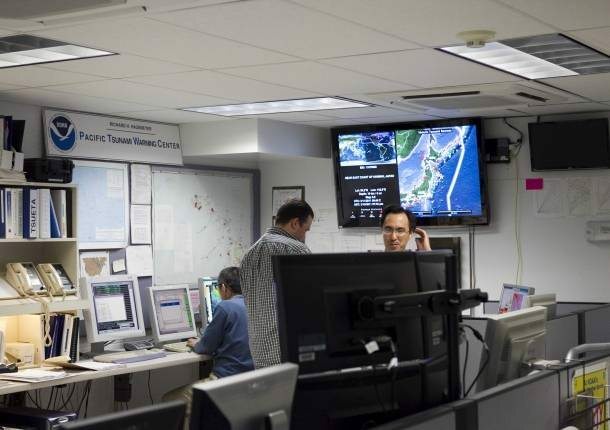 The Tsunami Warning Centre in Palmer, Alaska, placed Hawaii and parts of the US West Coast under a warning following Japan’s magnitude 8.9 earthquake, urging residents to stay tuned for more information on rising waves. “It’s not going to be a major damaging event,” said Gerard Fryer with the Pacific Tsunami Warning Centre as the surge began to hit, although he added there might be scattered damage. Waves were measured at 48cm at Nawiliwili on the island of Kauai, according to officials at an emergency centre in Honolulu. The warnings also affected coastal areas through Central and South America as well as the western rim of the Pacific. US President Barack Obama said he was monitoring the tsunami threat to his home state of Hawaii and the US West Coast after expressing condolences to those killed in the earthquake and offering to aid Japan. We are asking all our citizens in the affected region to listen to their state and local officials. I have instructed FEMA (the Federal Emergency Management Agency) to be ready to assist Hawaii and the rest of the US states and territories that could be affected. Hawaii is about 6500km east of the epicentre of Friday’s earthquake. Hawaii authorities were arranging buses to evacuate residents and opening evacuation centres. Peter Carlisle, the mayor of the state capital Honolulu, told CNN authorities had ordered the evacuation based on the “worst-case scenario”. One of the things about tsunamis is they’re very, very unpredictable, and you can’t tell how many waves there are going to be, which wave is going to be the one that is … going to cause the greatest damage. It’s a very, very difficult situation to confront. The US Pacific Fleet command said, however, that it would not be evacuating any personnel or sailing ships out of Pearl Harbour, on the south-eastern side of Oahu island, near Honolulu. Projected wave assessments inside harbour indicate no need to sortie ships. Taking all measures to ensure ships secure in port. The tsunami warning centre, based in Ewa Beach, west of Honolulu, issued a widespread warning extending across virtually the entire Pacific Ocean, including Antarctica and South America. Waves heights cannot be predicted, and the first wave may not be the largest, it said. People scrambled to stock up on fuel, and arguments broke out as lines formed in front of service stations, the Star Advertiser reported. The warning issued by the Alaska monitoring station extended to Hawaii, the northern and central California coast, the Oregon coast, and parts of Alaska. It urged residents to move inland and to higher ground.